"This sleek, showerproof coat has a detachable quilted lining that you can remove if the sun shows its face, as well as practical press stud pockets to store your bits and bobs safely. And did I mention it looks blooming fantastic?" 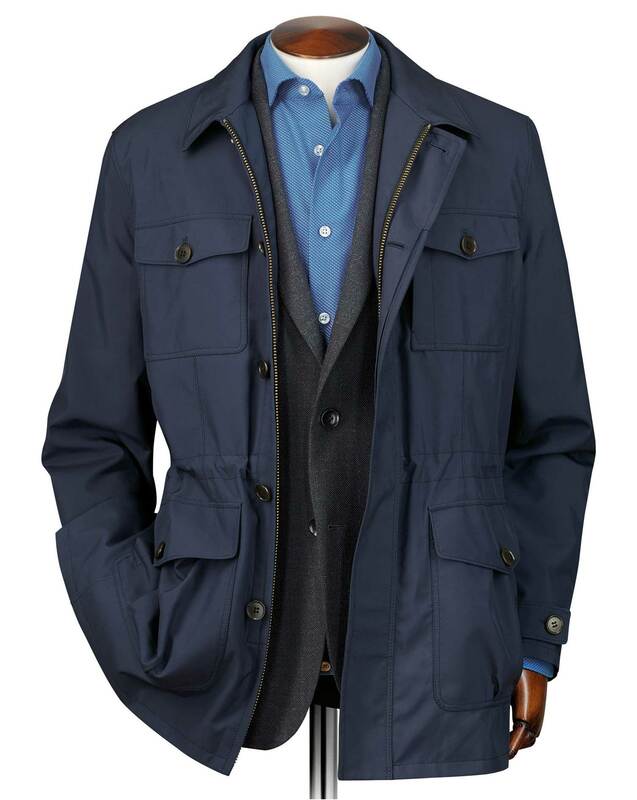 "With a detachable lining, this jacket will keep you warm, dry and looking your best – work to weekend." Response from Charles Tyrwhitt: Thank you for sharing your feedback regarding your recent order. I am glad that you are pleased with the quality and I am positive that this will see you through many a shower/ downpour. At Charles Tyrwhitt, we believe that focusing on quality is the most important element. We do like to keep our products uncomplicated yet timeless in their design. Please do let us know if you have any further suggestions that we can share with our buying team for future products. Response from Charles Tyrwhitt: At Charles Tyrwhitt, we do our very best to ensure that our products are sized accurately, so I am very disappointed that you had to return the jacket. We do understand that it can be slightly challenging with the sizing of jackets as the sleeve remains at a fixed length, only determined by the chest size chosen. I will be sharing your experience with our products team for review so I must thank you for taking the time to leave your feedback. Beautiful jacket, quality material and great fit. Seems to be a nice jacket but much too expensive. Response from Charles Tyrwhitt: I am sorry to hear that you have been disappointed with your recent purchase experience, I have contacted you directly so that we can discuss this matter further and hopefully find a suitable resolution for you. Response from customer: Was contacted by CT, got the pricing issue resolved and a merchandise credit issued. Happy Customer! The arms are a bit shorter than I'd have liked, but a larger size would have been too bulky otherwise. Response from Charles Tyrwhitt: We appreciate you providing your thoughts and feedback regarding the Navy showerproof field coat, which shall be taken on board. We hope the sleeve lengths do not cause any inconvenience for you and that you are otherwise impressed with your new purchase.